I have a bad habit of leaving cupboard doors open as I get things for what I’m making. I promptly bang my head on them as soon as possible after opening them. Not cool. I have to stop that. It was a habit of mine as a kid to sneak spoonfuls of cookie dough out of the fridge. The batter bowl was constantly full of chocolate chip cookie dough just begging for me to sample it. Because of this I would say, that I have a pretty serious relationship with cookie dough. We’ve been together as long as I can remember. That’s one of the reasons that these are such a dream come true! These are amazing! And don’t even bother worrying about the whole raw egg thing since there are no raw eggs in the middle of these cute little truffles. ALSO, these could even be made vegan simply and gracefully. So here you go guys! 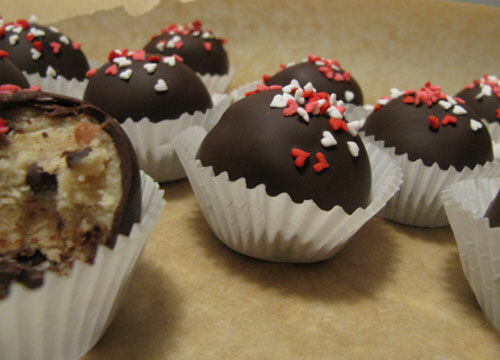 Make these because it’s Thursday, make them for your best friend for Valentine’s Day! Make them for some cutie who’d appreciate them, but mostly just make them. In a medium bowl cream the butter and sugar together using an electric mixer until light and fluffy. Beat in the flour, condensed milk and vanilla until incorporated and smooth. Stir in the chocolate chips. Shape the dough into 1-1/2 inch balls. Place on a baking sheet lined with wax paper or parchment paper, cover loosely and transfer to the freezer for 1-2 hours. 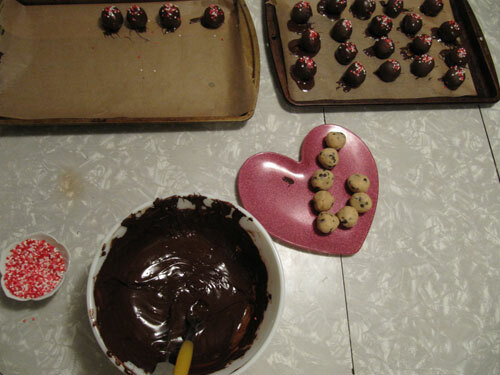 When ready to dip the truffles, melt the chopped chocolate in a heatproof bowl set over a pot of simmering water. 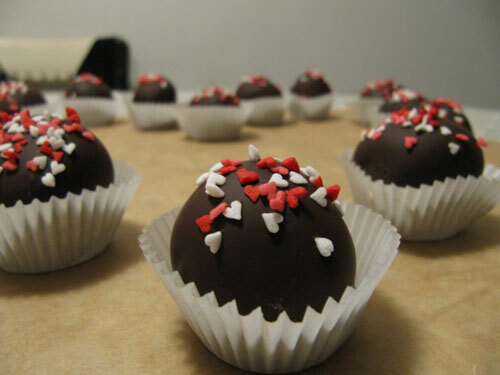 Drop each chilled truffle one at a time into the chocolate, rolling around to coat thoroughly. Lift out of the chocolate with a fork and allow the excess to drip off. Using another fork transfer to a wax paper or parchment paper lined baking sheet. 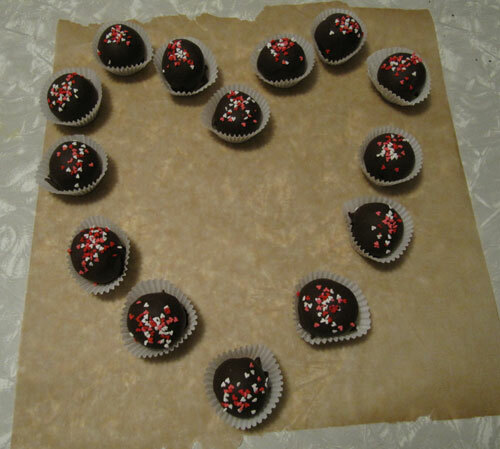 Scatter sprinkles quickly after dipping each truffle to ensure they stick, before the chocolate sets. Once all the truffles have been dipped, store in the fridge until ready to serve. Whoa whoa here’s my layout for dipping. Occasionally the chocolate got too thick to leave the truffles smooth so I’d pop that bowl over the pan of water and turn the heat back on for a minute to get it melty again. Also, if the chocolate’s getting low, use some spare mini chips and melt those suckers and keep going! There’s that magical cookie dough center. Jeez louize. It’s just about too good to be true. These were a dream come true. So good, I ate one that wasn’t even meant for me. I think Katie ate mine… so sad.. because I really DO want one ! These are so cute that I could just swear! I adore cooking and baking, and this site is such an adorable inspiration. Go, Megan! Thanks Kristy! These guys are definitely swear-worthy. I’ve made these too. Cookie dough wrapped in chocolate, what’s not to love? Next post: Hippo Valentine’s Day!